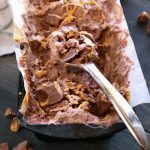 This No Churn Chocolate Peanut Butter Cup Ice Cream is the perfect cool treat for chocolate and peanut butter lovers! It's SO easy to make with only a few basic ingredients and it's the perfect ice cream for summer! Using a hand mixer or stand mixer fitted with the whisk attachment, whip the heavy cream on high speed until soft peaks form. At the soft peak stage, start drizzling in the sweetened condensed milk as you whip until it's fully incorporated and the cream is thick and fluffy. Fold in the cocoa powder with a rubber spatula, being careful not to deflate the cream mixture. Line a loaf pan with parchment paper and melt the peanut butter in the microwave, just until slightly more fluid than normal (so you can drizzle it). Add a layer of the chocolate cream mixture into the bottom of the loaf pan, top it with a drizzle of the peanut butter and some peanut butter cup chunks. Add another layer of the chocolate cream mixture, peanut butter and peanut butter cup chunks, and repeat this process one or two more times until the loaf pan is full. Freeze for 6 hours or overnight for best results. Depending on the temperature of your freezer, leaving the ice cream at room temperature for a few minutes before scooping and serving might be necessary. For best results, freeze in a fridge-freezer, not a deep-freeze freezer.